Our educational program values the “whole” child, and strives to enrich their social, emotional, physical, and spiritual health by providing daily opportunities for children to grow and develop their God-given abilities through developmentally appropriate activities. Our preschool is designed to promote future school success by building a solid academic foundation and instilling a love for learning. We feel that it is our responsibility to provide a Christ-centered environment for the children in our care that is safe, loving, nurturing, and forgiving. We are also committed to strengthening the family unit and helping families thrive according to God’s purpose. Students are involved in a variety of learning experiences explored through centers and group activities, which include language arts, math, science, large and small motor development, sensory expression, computer skills, dramatic play, Bible stories, music, and creative movement. Our curriculum is structured, age appropriate, and allows children to develop at their individual rates. We also supplement the curriculum with field trips and special visitors. 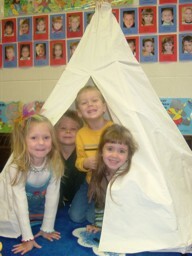 The preschool staff is highly qualified in the area of early childhood. All staff members attend conferences to further professional development. The preschool staff is dedicated to their profession and strives to instill and model Christian values such as respect, empathy, kindness, and patience. Student’s individual needs are met within a loving and caring environment which nurtures healthy self esteem. Minimum of 6:1 student/staff ratio. Read more.